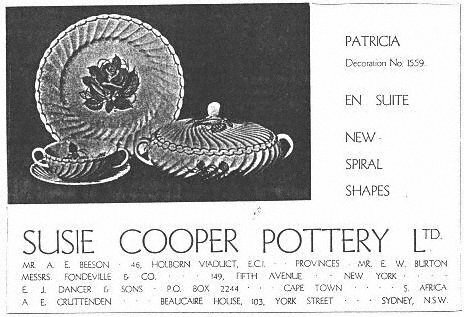 The following advertisments are all from trade magazines or magazines available to the general public in which Susie Cooper advertised during her career. Also included are items of contemporary publicity material which were available. They are roughly in chronological order. New items will be added as and when we come across them. Patricia pattern number 1559 shown on the new Spiral Shapes. Read more about this pattern in our special feature Patricia Rose. Featured here on the bone china Quail shape is the Fragrance pattern. 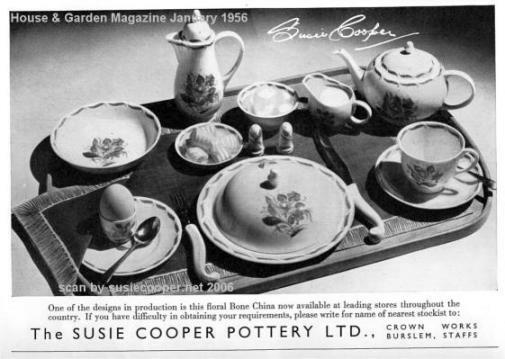 This breakfast set would probably have been compiled using items which were all available for sale seperately at the time the advertisment was produced. Image can be clicked to enlarge. 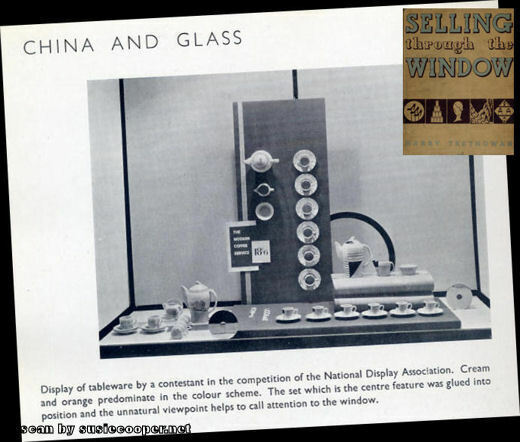 Although not a commercial advertisement the follow item appears in the book Selling Through The Window by Harry Trethowan published by The Studio Ltd in 1935. It shows three Susie Cooper Kestrel coffee sets displayed in a window dressing competition. The vertical signage reads 'the modern coffee service 18/6' below this are the words 'Susie Cooper' arranged vertically. It is not clear from the description if this was a competition entry by Susie Cooper or if the entrant just decided to use Susie Cooper pots for the display. The vertical coffee set is hand painted floral as is the set to the left, the set on the right is a hand painted modernist design.